Winter is officially here, and we all know what that means; Snow. Snow may be great for skiing and snowboarding but can be a serious problem for cars during the winter. 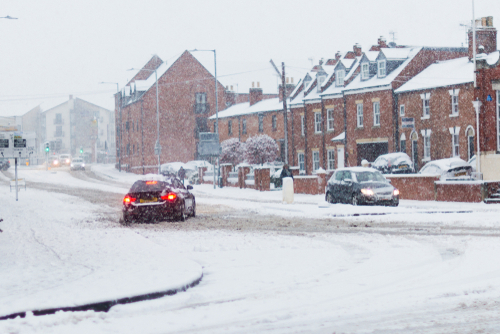 Here are some tips for driving safely in snowy conditions so that you don’t end up driving your car into someone’s living room. Every car’s breaks work slightly different. Whether your breaks are a bit touchy or require a bit more pressure than normal, it’s important to know the car you are driving the breaks that coincide with them. A rule of thumb when it comes to breaking is to keep your heel on the ground and apply firm, but not forceful pressure using the ball of your foot. It can be intimidating seeing a snow-covered hill and your first thought could be “I want to get up this as fast as possible!” If you face the task of having to go up a hill, the best course of action is to try and gain enough inertia before going up the hill not during. If you are going down a hill, try and reduce your slow down as much as possible to avoid picking up un wanted speed. They say the average amount of time that should be between you and the car in front of you is 3-4 seconds in normal conditions. When you’re driving in the snow, you should at least double that to give yourself plenty of time in case you need to stop or take evasive affection. It takes a lot more inertia in the snow to get your car moving in comparison to normal conditions. If you can slow down without necessarily having to stop, it will make it much easier to gain speed. For example, if you are coming up to a traffic light with no cars around, slow down in advance to a point where you can coast up to the light by the time it turns green. It will decrease the chance you spin out upon speeding up or having to apply unnecessary pressure to the gas pedal. Extra precautionary measures should be taken during the winter season when driving. Getting over aggressive and speeding can result in slipping, sliding, and potentially crashing. Boston Board Up Services knows how tricky it can be to navigate in the snow. If you or anyone you know has unfortunately been in a car vs. structure accident, contact (800) 949-9113. We offer 24-hour service for emergencies and have a team of experts that know how to handle the situation no matter what the circumstances are.